This is in the big scale industrial area of LA called Vernon, the paper mill is over a hundred years old . I almost dropped to my knees in wonder when I found it in the morning. This this is the oldest and most spectacular factory I've ever painted. I was set to meet painting pals J- Mac and now ex- student William Moore that afternoon, and I almost didn't take them there. I liked it so much a wave of selfishness washed over me, I wanted to keep it to myself. On the other hand I had to share it with them, how couldn't I? I did 80% of it PA and the sun was gone. Just finished it in the studio. Great painting! Also loved the Caboose painting yesterday. You'd love New Orleans. So much blight, ya just don't know where to start. Seriously, areas that weren't touched by the storm still have their wonderful, old, pre-Katrina blight in place. As tastless as this sounds I'd love to paint the ruined areas as well as the untouched blight... Oh for a patron. this one is great! how much time do you invest in actually looking for these places to paint? I never thought about it. I guess about 8 hours a week on average. I'll often time a trip somewhere with time to explore a bit and take photo's. Or when I ride my bike I'll bring my camera. It's more relaxing for me that painting itself. beautiful, love the texture. It enchances the mood! A paper mill today, a pencil factory tomorrow. Men can dream, can't they? Great painting, Bill! Another inspired work! Do you carry a painting setup in a backpack, on your bike? You'd be in good company painting New Orleans. Monet did some flood paintings. Ruined areas deserve to be immortalized in paint. The mood reminds me of an old man sitting on a park bench... excellent paints. Wow, this one is amazing. 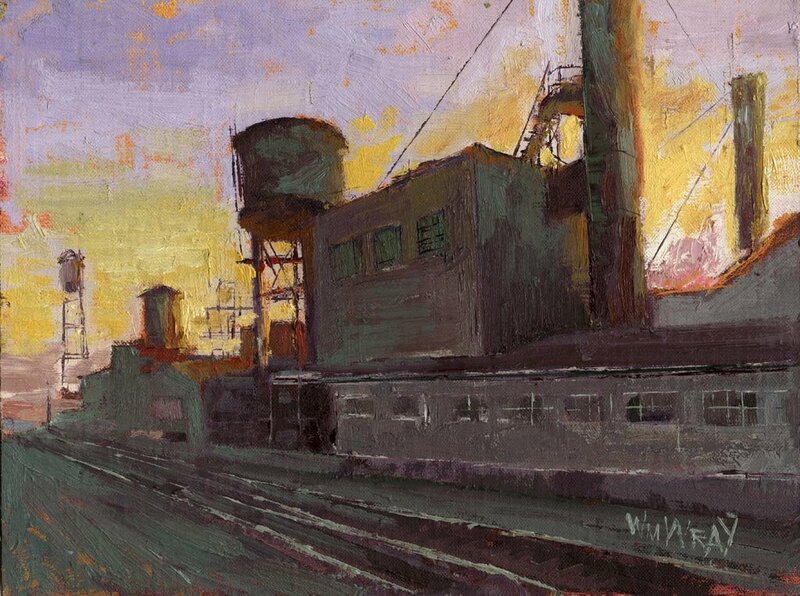 The waning light complements the dark side of the mill, and you're right--this was overall just a great subject to paint! I especially like the stairs. Helluva job! Good on ya, this is a wonderful painting! My favorite part is the way you handled the greys. There's almost a green-orange-violet split complementary thing going on-don't know if you planned it that way or it's just your natural ability and color sense flowing out. Either way, it rocks. Love the old buildings, that water-tower is great. Your bright sky color makes for a strong graphic read of the piece. Hey Alina, Glad you like, its nice when your are specific about something. Hey dan, Rool of paper as big as sewer pipes, enough to draw on for 3 lives. Glam, no painting via the bike, just photo's. if you look far back enough in the archives. I have a painting of a old man on a bench, I guess I'm repeating myself already. thanks BG I'm excited about the site. It was too broken up so I defaulted to what I know about complements... and it kind of worked. thanks Heidi, I hope I am. thatks Marlo, Glad you took it he right way. You drawings are reminding me of John's best early work.